We’ve considered all the questions we get asked as eye surgeons and filmed ourselves sharing our answers. We hope they help you learn more about eye surgery. 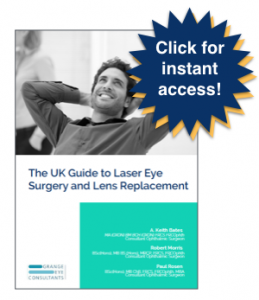 By Grange Eye Consultants|2019-01-03T17:41:10+00:00February 20th, 2019|Categories: Cataract Surgery, Refractive Lens Exchange, Video FAQs|Comments Off on How does lens replacement treatment work? By Grange Eye Consultants|2018-12-31T05:05:07+00:00January 23rd, 2019|Categories: Refractive Lens Exchange, Video FAQs|Comments Off on Does lens replacement treatment hurt? By Grange Eye Consultants|2016-11-04T11:13:24+00:00August 25th, 2016|Categories: Paul Rosen, Refractive Lens Exchange, Video FAQs|Comments Off on What are the risks of refractive lens exchange? By Grange Eye Consultants|2016-03-11T10:08:16+00:00August 22nd, 2016|Categories: Refractive Lens Exchange, Robert Morris, Video FAQs|Comments Off on What are the risks of refractive lens exchange?